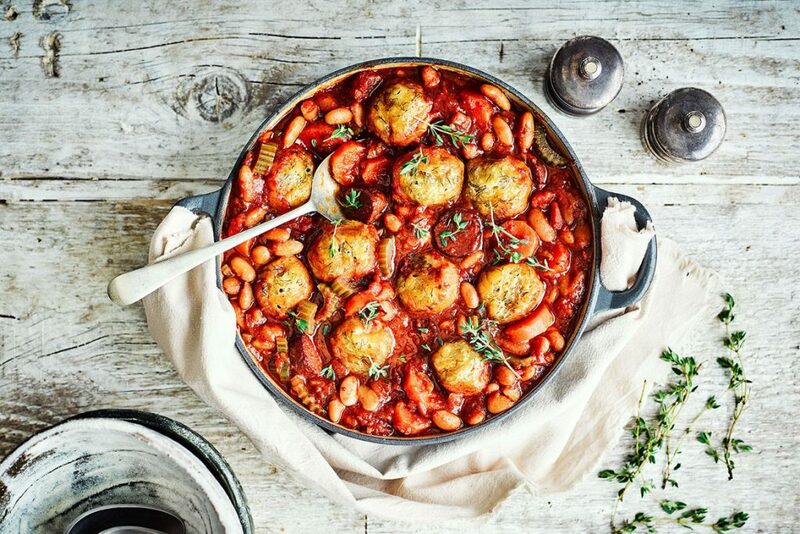 Everyday eating was the focus before, but Lucy Watson’s follow-up vegan cookbook is all about entertaining. Prudence Wade finds out more. 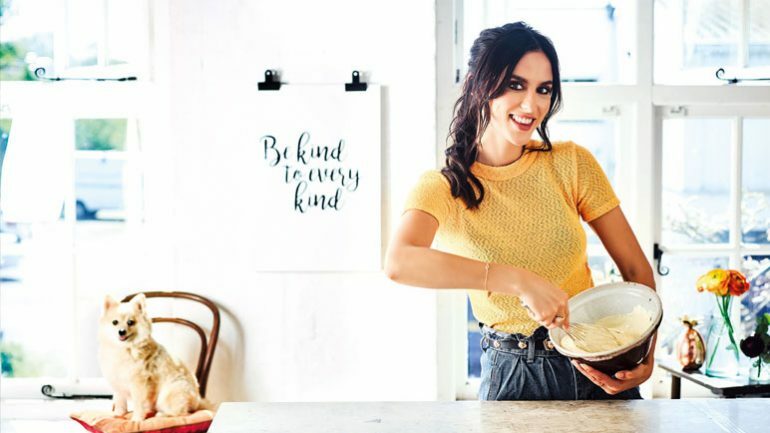 Lucy Watson might have found fame as a no-nonsense straight-talker on Made In Chelsea – but her reputation has definitely mellowed since leaving the hit reality series, as she’s found her niche in vegan cooking and paved a new career path. Far from just a passing food fad, plant-based eating seems to be here to stay, and Watson’s just released her second cookbook, Feed Me Vegan: For All Occasions. Where the 27-year-old’s first book, published last September, was all about finding vegan-friendly versions of her favourite meals, now that she’s more experienced, her focus has shifted to entertaining – something she says she can’t get enough of. Now that Watson has mastered basic survival on a vegan diet, she’s enjoyed being able to switch her attention and indulge in what she really loves: Entertaining. Since her first book, Watson’s attitude towards food and eating has shifted; she’s taking more pleasure in the process now. “The time I’m willing to put into cooking has changed, and I’m not all about the quick and easy life as much as I used to be. I increasingly want to make stuff that requires a bit more patience – like fermenting food overnight, or spending a whole day preparing a roast,” she explains. It’s perhaps no surprise Watson chose vegan entertaining as the theme for her new book: Plant-based eating has exploded in popularity over the past year, and there’s now a bigger market for in-depth and crowd-pleasing recipes. “Veganism has definitely turned into a trend,” she agrees, citing the record-breaking success of this year’s Veganuary – the campaign to get people to eat plant-based for the month of January grew by 183% in 2018, with 168,542 people signing up. This is where Watson really warms to her topic; although she loves cooking, it’s animal activism that really fires her up – and she’s by no means quiet about this on Twitter. Feed Me Vegan: For All Occasions by Lucy Watson is published by Sphere, priced £18.99. Available now. Put the white beans in a saucepan, cover with water and bring to the boil. Boil the beans for 10 minutes, then turn off the heat and leave to soak for three hours. Drain the beans after they have soaked. Leave to one side. Preheat the oven to 150°C (130°C fan, gas 2). Put the oil in a flameproof casserole and cook the onions over a medium heat until soft and translucent. Add the garlic and chorizo, and cook for two minutes. Stir in the tomato paste and cook for one minute. Add the wine, bay leaves and thyme, and allow to bubble away for four-five minutes until reduced. Add the remaining ingredients, including the soaked beans. Bring everything to the boil, cover and transfer the casserole to the oven and cook for two-and-a-half hours. Meanwhile, to make the dumplings, sift the flour into a mixing bowl and stir in the lemon zest and chopped dill. Add the suet and rub into the flour with your fingertips. Add the mustard and enough cold water to bring the dough together. Roll into walnut-sized balls. Add a splash of water to the stew if it’s looking a little dry. Put the dumplings on top of the stew, increase the oven temperature to 190°C (170°C fan, gas 5), put the lid back on and cook for a further 30 minutes until the dumplings are fluffy and firm, then serve. Make the frozen ganache the evening before if possible; however, if you are short of time, two hours in the freezer should do the trick. To make the ganache, melt the chocolate with the milk in a heatproof bowl over a pan of gently simmering water, making sure the base of the bowl doesn’t touch the water. Stir occasionally with a small whisk or spoon until the chocolate has melted and is combined with the milk. (Alternatively, put the ingredients in a microwave-safe bowl and microwave at full power for 30 seconds. If there are still lumps of chocolate, put it back into the microwave in 10-second blasts, stirring each time, until completely combined and smooth). Pour the ganache into an ice cube tray and put into the freezer. Leave to freeze for at least two hours. Thirty minutes before you want to serve your fondants, preheat the oven to 180°C (160°C fan, gas 4). 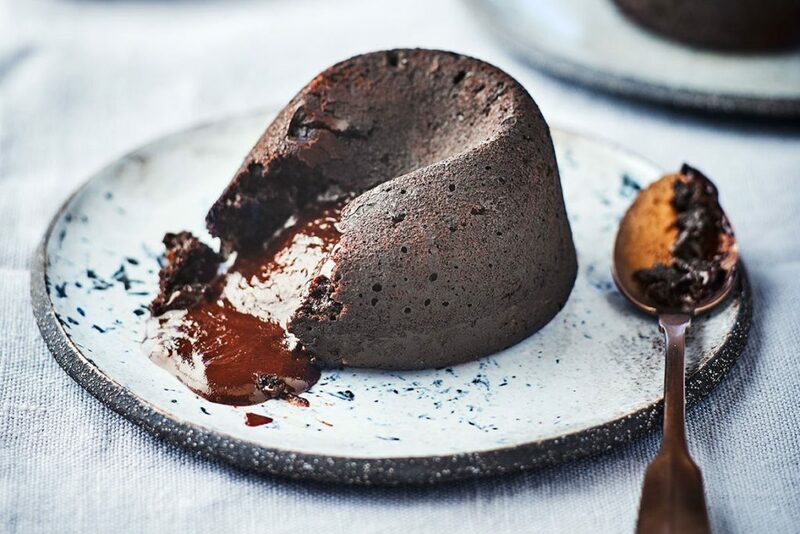 Take four small individual pudding moulds or ramekins that will comfortably hold an ice cube, grease them with oil and dust with a layer of cocoa powder. Sift the flour, cocoa powder, bicarbonate of soda and salt in a large mixing bowl. Using a whisk, mix the sugar into the dry ingredients. In a separate bowl mix together the milk, plus 150ml of warm water, the coffee, vinegar, flaxseed and oil. Using the whisk, mix the wet ingredients into the dry ingredients until the batter is combined. Fill each pudding mould to about a quarter with the fondant mixture, then place a frozen cube of ganache on top. Cover the ganache with more fondant mixture until the pudding mould is just over half full. Gently tap the moulds on the work surface to remove any air bubbles. Put the filled moulds onto a baking tray and bake in the centre of the oven for 14 minutes – do not be tempted to open the oven door! When the timer goes, remove from the oven immediately. Gently release the sides of each pudding using a small round-bladed knife. Put a small serving plate on top of the mould and flip upside down so that the plate is now the right way up. Carefully lift off the pudding mould. Serve immediately with an extra dusting of cocoa powder. Put the flaxseed in a small bowl and add three tablespoons of hot water. Stir well, and then leave to gel for five minutes. Sift the flour and salt into a bowl and add the milk, the flaxseed mixture and the melted margarine. Whisk together to make a smooth batter. Rest the batter for 30 minutes. Heat a knob of margarine in a non-stick frying pan over a medium heat and add a ladleful of the batter, then swirl the pan to coat the base with the batter. 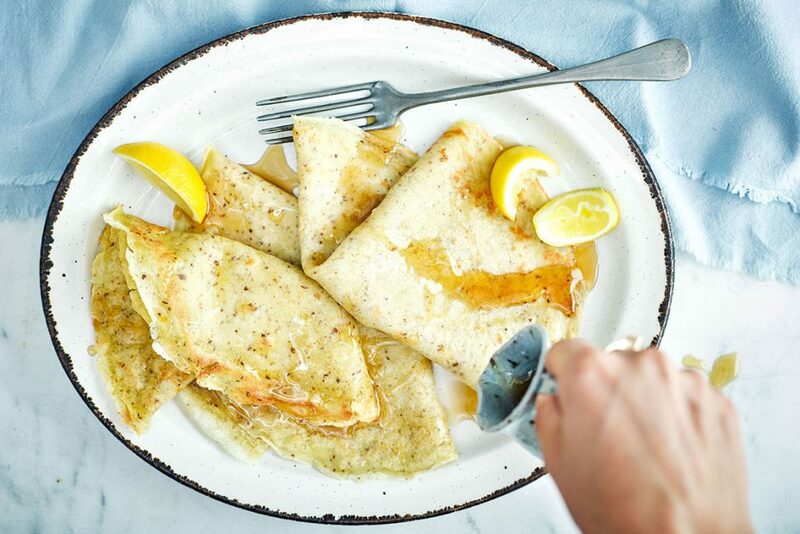 Cook the crepe until golden, then toss it or turn it over using a spatula and cook the second side in the same way. Keep the cooked crepes warm while you repeat with the remaining batter.